I listen to a lot of audio books. Because of that, I tend to recommend them to other people, especially if they say they like to read but don’t have time. One of the most frequent concerns I’ve heard about audiobooks relates to speed. Many audiobook readers speak very slowly. This was a big problem for me when I started listening to audiobooks, some of the narrators were so slow that I got bored. Some people think that readers are too fast, which made it hard for them to follow the story. I haven’t had that problem so far, but I can certainly understand it. This brings us to today’s post. I’m going to show you one way to adjust the speed of your audiobooks. I know that many audiobook players come with built in speed control, but I still prefer this method, simply because of the tight control that it gives me over pitch as well as speed. 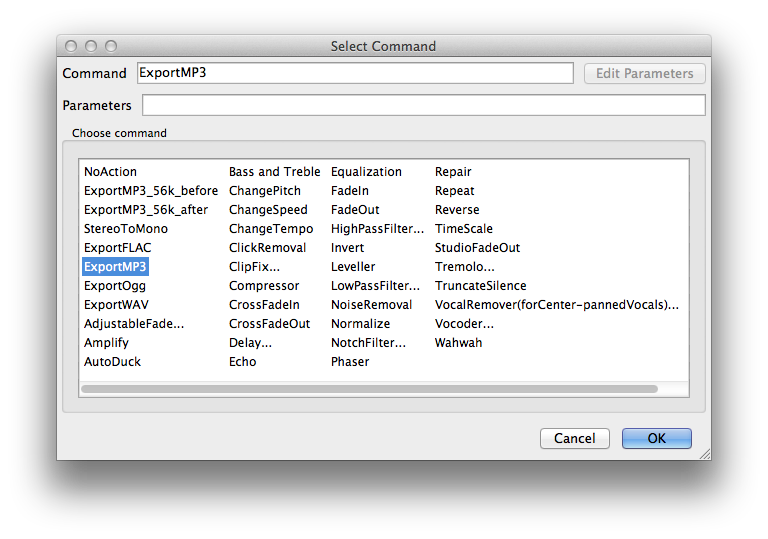 I highly recommend getting the LAME MP3 encoder so that you can export your final output as an MP3. 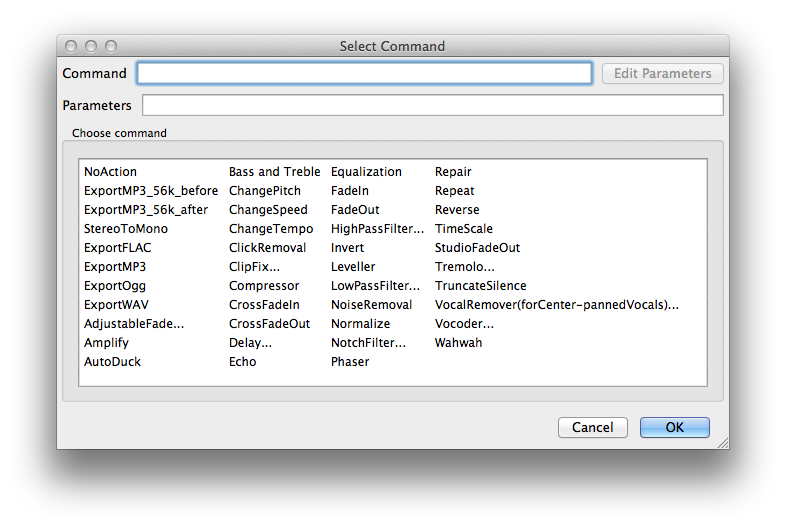 Without getting the encoder, you’ll be limited to WAV, AIFF, AU, and FLAC file types. You can get the encoder from LAME’s website. 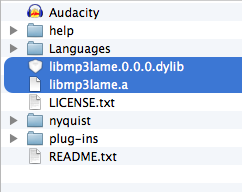 Once you have it downloaded, place the .dylib (Mac) or .dll (Win) file in the same folder as Audacity. The first time you export to MP3 Audiacity will ask where the encoder is, just point to the .dylib/.dll file, and you’re set. If possible, always start from WAV or AIFF files. 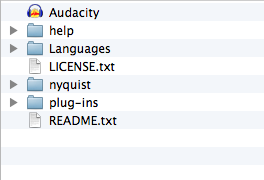 These file types won’t lose any quality when imported into Audacity. Every time you export from Audacity as an MP3 (or other lossy audio format), this encoding necessarily degrades some of the original quality of the audio. If you import an MP3 into Audacity, edit it then export it as an MP3, you are thus losing quality twice – once in the original MP3 encoding of the imported audio, then again when you export it from Audacity as MP3. Therefore when you are exporting as MP3, work with the highest quality copy of the audio that you can – preferably a copy in a lossless format such as WAV, AIFF or FLAC. You can always obtain a lossless copy of an audio CD by extracting its audio to a WAV or AIFF file. Never extract the audio from a CD to MP3 if you want to export it from Audacity as an MP3. If you can’t avoid importing an MP3 into Audacity and then re-encoding to MP3, don’t believe what you sometimes hear that using the same or higher bit rate as the original file will prevent quality loss. This is incorrect. All you can say is that the higher the bit rate you re-encode to, the less will be the quality loss that results. I haven’t had any issues using MP3s, but if you’re particular about your audio quality, this is something to keep in mind. I suggest opening a small file from the middle of the book to start. The goal with this sample file is to determine the speed increase, large files can take a long time to import and adjust, so the smaller the file, the easier this step will be. Select a portion of your file near the middle by clicking withing the waveform and dragging the cursor to the right or left. I recommend about a 30 second sample. Then press the play button at the top left and listen for 5 to 10 seconds. This will give you an idea of how fast the narrator reads. 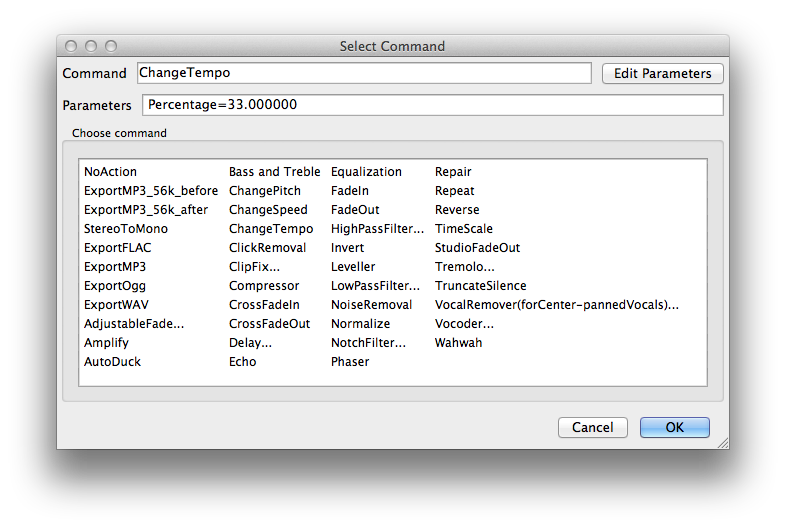 Stop the playback, then, without clearing your selection (or if you already have, select a new sample), open the ‘Effects’ menu. You can enter in a value or use the slider to choose the percent increase. If you want to speed up the book, I recommend starting at either a 25.000 or 33.000 percent change. Click ‘OK’ and Audacity will take a second or so to adjust your selection. Again, without clearing your selection, press play and listen to the change. If you like the speed, great, move on to the next step. 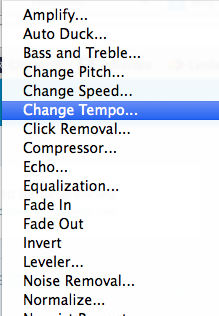 If it’s too slow or fast, you can undo the change from the ‘Edit’ menu, then repeat this step with a different value. 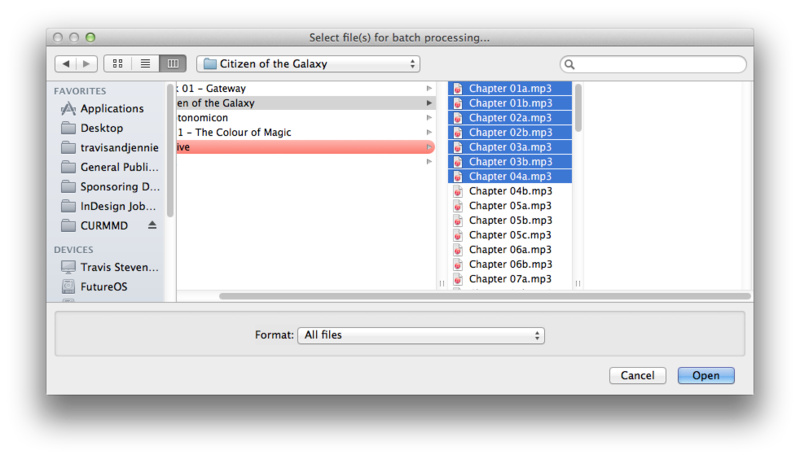 Once you’ve found a good speed, it’s time to create the batch process that will allow you to run all of the book files automatically. 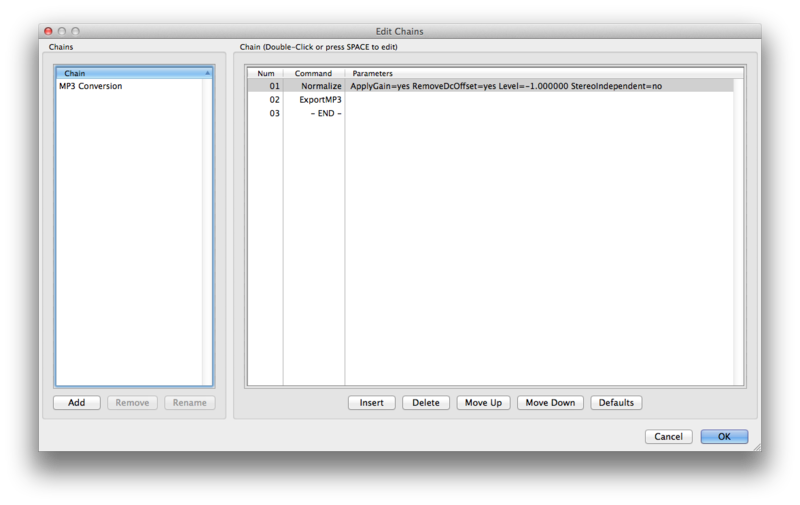 While you can set up the chain when a file is open, I recommend closing your sample file now. Don’t bother saving it. Open the file menu and select ‘Edit Chains…’. If you don’t see the option, create a new file first. Don’t open an existing file as that will add steps later on. Name the chain whatever you’d like. I named mine ‘Speed up – 33’ so I know what the chain will do and what the percent increase will be. 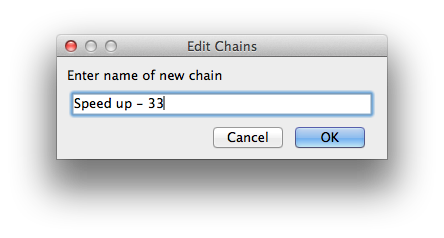 You’ll see your new chain appear in the ‘Edit Chains’ dialog. Double click on ‘ChangeTempo’ to place it in the ‘Command’ box. 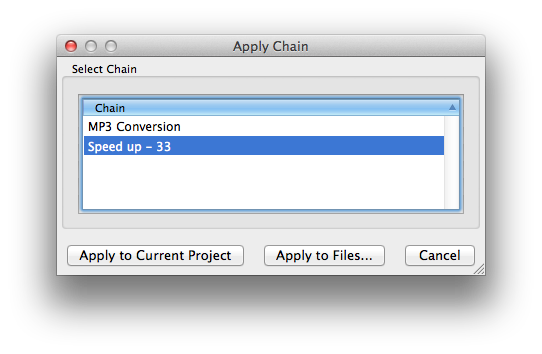 This puts us back at the ‘Edit Chains’ window, where we see that the ‘ChangeTempo’ command is now part of our ‘Speed up – 33’ chain. Speeding up the file is not enough, that will just change the speed within Audacity. The next step is to export the file. 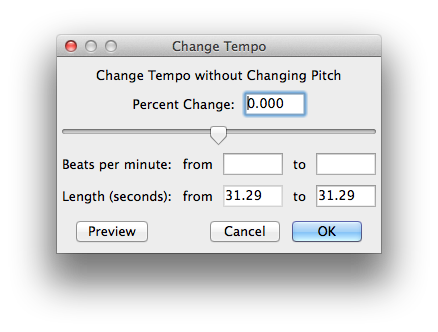 The ‘ExportMP3’ command should appear underneath the ‘ChangeTempo’ command in the ‘Edit Chains’ window. That’s it. The chain is ready to use. Click ‘OK’ to exit out of the window and go back to the blank file. 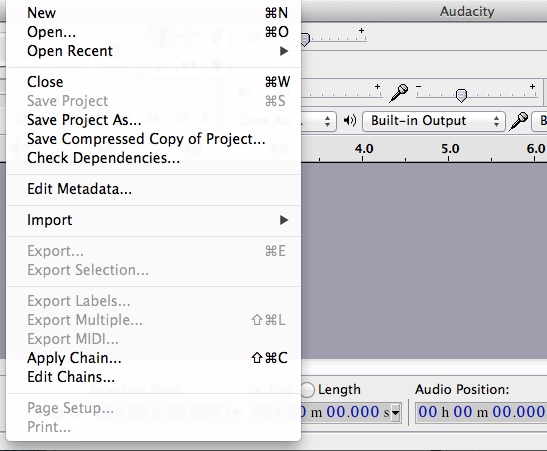 Before you run your chain, I recommend shrinking your Audacity window to the smallest size you can. Chains can take a while to run and you can’t minimize any of the windows during the process. I shrink my window and move it to a corner of the screen, this keeps it mostly out of the way and gives me room to do other things while I’m waiting. When you’re ready, have a blank file open and and select ‘Apply Chain…’ from the ‘File’ menu. That’s it. The chain will automatically start opening files and making changes. The process can take a long time (I’m talking hours), especially if the entire book is in a single audio file or you don’t have a lot of available memory. The new, sped up files will appear in the same folder as the original audio files you selected in a folder called ‘cleaned.’ They will keep the same file name and metadata associated with the original files. As I said at the beginning, this is something that works for me. I’ve set up three different chains like this (one at 25%, one at 33%, and one at 40%), so that I can pick the one most appropriate for a specific narrator. If you have any other ideas or methods on how to adjust the speed of an audiobook, I’d love to hear it. I’m always looking for improvements.